The Swedish Academy of Sciences described her as a "helpmeet" to her research partner husband when they won her first Nobel Prize. The French Academy of Sciences turned down her membership application solely because she was a woman. The president of the United States praised her as "the noble woman, the unselfish wife, the devoted mother," another example of speeches referring to women mostly as mothers, wives and daughters. So it's no wonder, really, that when Marie Curie gave her lecture after winning the Nobel Prize for a second time--the first person ever to do so--she made no reference to her gender. Instead, in this second speech, Julie Des Jardins writes, "she paid tribute to her husband but also made clear that her work was independent from his, spelling out their separate contributions and describing the discoveries she had made after his death." Like many women, she found that society wanted to paint her as the mother, as a whore (for having an affair after her husband's death), or as a genderless entity. Perhaps that last option seemed the safest. If this seems odd to you, please note that, more than a century later in 2014, women academics are still explaining why they must insist on being referred to as "Doctor" or "Professor," to counteract their male students downgrading them to "Mrs.," even when they are not married. Some 15 years ago the radiation of uranium was discovered by Henri Becquerel, and two years later the study of this phenomenon was extended to other substances, first by me, and then by Pierre Curie and myself. This study rapidly led us to the discovery of new elements, the radiation of which, while being analogous with that of uranium, was far more intense. All the elements emitting such radiation I have termed radioactive, and the new property of matter revealed in this emission has thus received the name radioactivity. Thanks to this discovery of new, very powerful radioactive substances, particularly radium, the study of radioactivity progressed with marvellous rapidity: Discoveries followed each other in rapid succession, and it was obvious that a new science was in course of development. Her Nobel Prizes made her the most famous woman in the world, and it's said Curie disliked the publicity that came with that. But when her moment of glory came, she used the lecture--preserved to this day online--to set the record straight about her contributions and research. What can you learn from this famous speech? Speak for yourself: Throughout her career, others tried to speak for or about Curie, often trying to reshape her story in ways that made her uncomfortable. This speech let her lay claim to her achievements and to do it in a form--a scientific lecture--with which she was most comfortable, and which would establish the value of her work. Add clarity and poetry: The lecture may be tough going in places for the non-scientist, but as scientific lectures go, it's a marvel of clarity. That, too, underscores the validity of her work. As Einstein, a contemporary and friend of Curie, said of scientists, "If you can't explain it to your grandmother, you don't understand it." She points out that radiation "can provide a means of seeking new elements," then, at the very end, describing this new area of science, she calls it "the chemistry of the imponderable." It's poetic license, but makes clear just how much was not yet known and needed to be explored. Set the example: By ignoring her gender, Curie was setting an example for how to talk about her scientific achievements as scientific achievements, not as curiosities done by a helping female. You can do the same, not just in your remarks about yourself, but your introductions, comments and speeches about others. 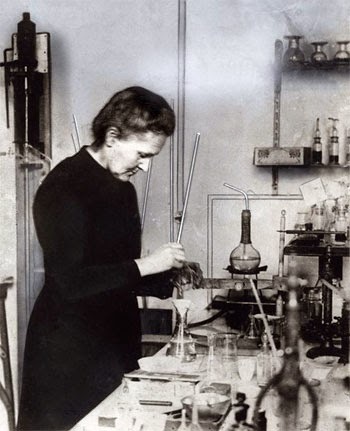 You can read Curie's 1911 Nobel lecture here, and the article Madame Curie's Passion here.